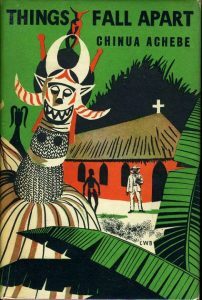 First published in 1959, Chinua Achebe’s Things Fall Apart is widely read as a quintessential African novel. It is set in the southeastern Nigeria prior to the arrival of westerners and the beginning of colonialism in this region of the African continent. The novel details the customs, language, culture, religion, and family customs of the Igbo people as they existed prior to colonialism and as they are confronted with the incursion of the colonial project in the form of European missionaries. Now read not just as an African novel, but also as a fine example of the colonialist discourse form the point of view of the colonized, we read a vivid dramatization of the clash of cultures and the ways in which one culture exerts in influence over another. The misguided notion that the colonizing power is bringing culture to a “primitive” and “uncultured” people become the primary themes in Achebe’s book. The protagonist is Okonkwo, a village elder and a man with his own personal flaws. While he attempt to fill his role as the patriarch of a family and an elder among his people, he is nevertheless plagued by the shadow of his lazy and drunken father. Okonkwo’s attempts to exert himself as a man and village leader are flawed by his own self-doubts and fears.